Another picture of the HTML representation of the probability table. Hopefully this makes a little sense. The word in bold is the current word, the word in the left column is the previous word, and the list of words on the right are words that follow, and the number of times that they occur. 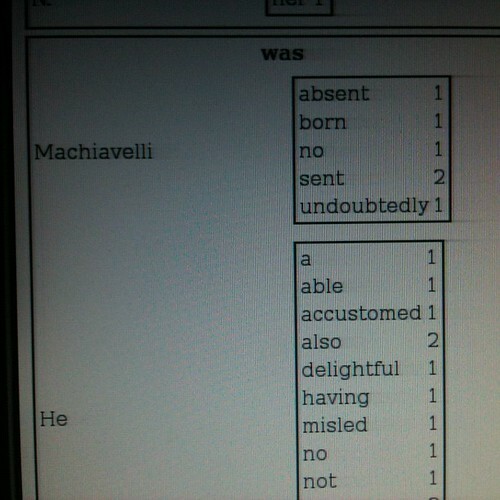 Thus we see that “Machiavelli was absent” occurs once in the text, while “Machiavelli was sent” occurs twice. This also means that I’m consuming front matter in which I am not actually interested, so there is more tinkering to be done.